The Frankish middle age town Ochsenfurt is located in Unterfranken (Lower Franconia) / Germany. Located on the southern tip of the “Maindreieck”. Surrounded by forests and extensive arable land (the “Ochsenfurter Gau”). Embedded in a river valley, grapes are cultivated here as everywhere else in this region, the therefore so-called “Weinfranken” (Wine Franconia). The roots of Ochsenfurt date back to the early Middle Ages, until the time before Charlemagne. The history of the city is multifaceted. The more intensive settlement of the situation began as often with the founding of a monastery. This was followed by many centuries in which the city saw a boom, a siege, wars and emperors. The Franconian town itself is quite small. This, however, makes the appeal of the medieval city, which is becoming increasingly popular among tourists from Germany and abroad. Without integration, just 8,000 people live here. And yet, without doubt, the city has the character of a regional center. Actually, there is almost everything here. From the hospital to the open air bath and various schools (elementary school, junior high, vocational school) to a McDonalds. 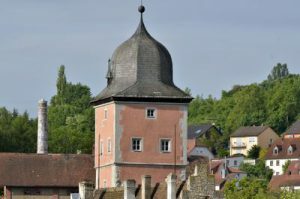 The fact that Ochsenfurt has more to offer in an economical sense than you would expect at first glance is due to its convinient location and historical and agricultural importance. Ochsenfurt is located in the immediate vicinity of a highway cross, which probably every german car driver knows: At the intersection of the A3 (east-west axis) and the A7 (north-south axis). The river Main, which characterizes the cityscape and the whole region, was and is regarded as an important traffic route, which in recent times has become more and more important for tourism. Apart from that, the Main was also an important location factor for a commercial establishment in Ochsenfurt for many companies in this beautiful region. The most important example in this sense is the sugar factory. And this sugar factory, too – especially in the autumn – contributes greately to the image of the city. This is exactly the case when white, sweet smelling water vapor flows out of the plant’s chimney. A smell that non-native people may have to get used to. For locals this smell simply belongs to the region just as colors do for autumn. In addition, the sugar “fabrik” may disturb the medieval image. On the other hand, the sight of sugar silos on the one hand and the defensive towers on the other offer a very interesting contrast. The “Ochsenfurter Gau” as a high-quality agricultural land forms the framework for the city, which is the most important shopping center for the surrounding municipalities. In the surrounding of Ochsenfurt visitors will find a multitude of tourist highlights. 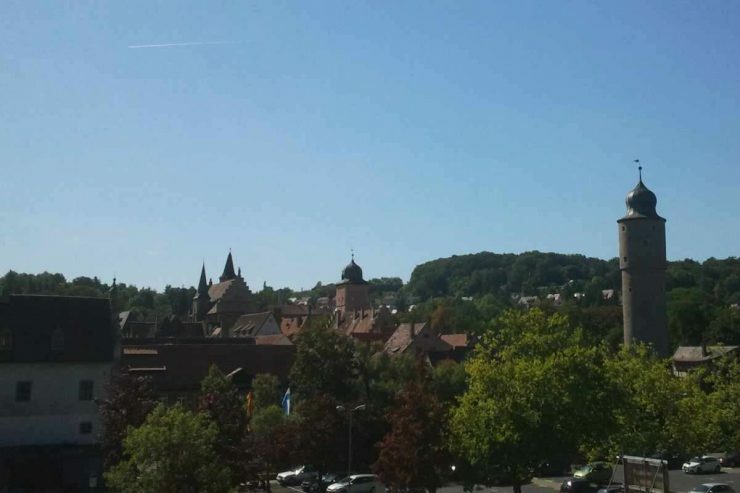 Thus, the cathedral city of Würzburg greets you very close (no 20 km away). The world-famous Rothenburg ob der Tauber is located about 40 km south of Ochsenfurt in the district Ansbach.